Prepared on Notepad by Ian Smith, This page created 1st August 2000. Best on 800*600. The Centrewest branch of London Buses had developed a small-bus policy in the late eighties, contentiously replacing Routemasters on routes 28 and 31 with Mercedes midibuses. The idea was that frequency mattered more than bus size, and that frequent small driver-only midibuses could replace large two-crew buses. It worked, up to a point, but there were quickly complaints about overcrowding. 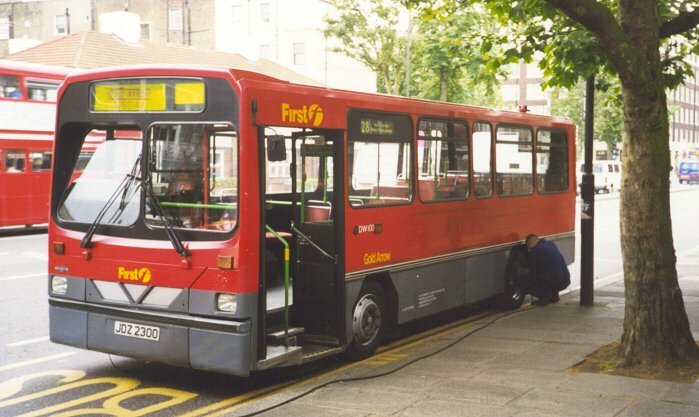 The Dart offered a better solution, and in 1990 Centrewest ordered the first of 170 8.5metre Darts with Handybus bodywork by Wrights of Ballymena. 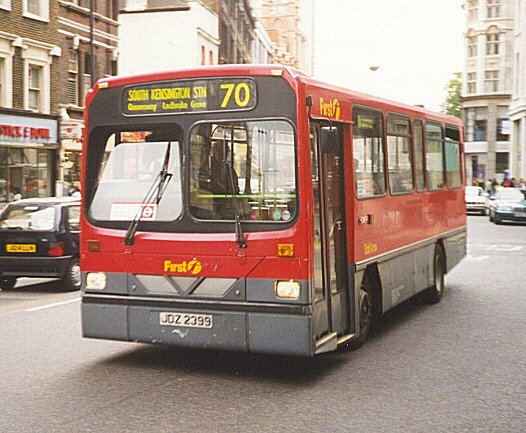 DW99 in Kensington High Street on route 70 in June 1998. Photos by Ian Smith. Click for larger versions. A new type classification, DW, was established, following the precedent set in the midibus years of signifying chassis and body builders where possible. 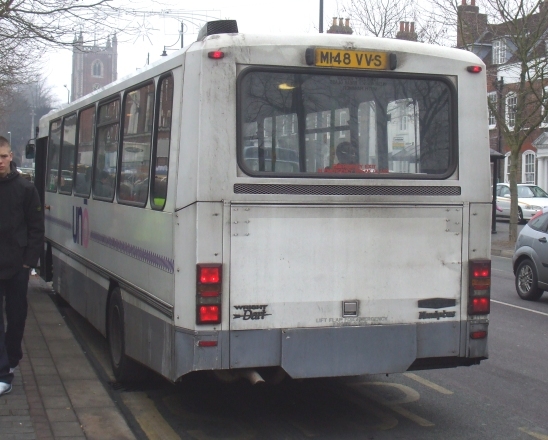 The design was conservative compared wityh the Duple / Carlyle version, with gasket rather than bonded glazing and a front end that was considered distinctly "retro", with a split flat windscreen, the drivers half angled backwards. But there was room for a decent display at the top. 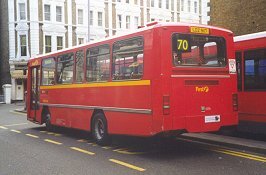 The door followed the London Buses fashion in being divided, with a split level to facilitate boarding by the elderly. 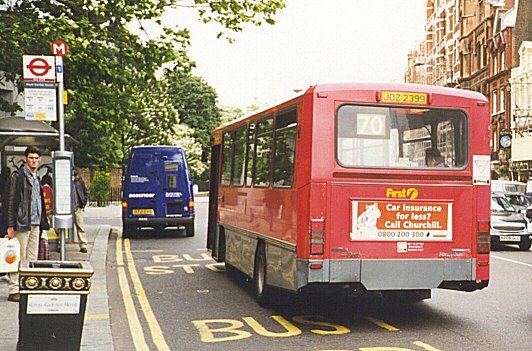 DW92 in Kensington High Street on route 28 in June 1998. Photos by Ian Smith. Click for larger versions. 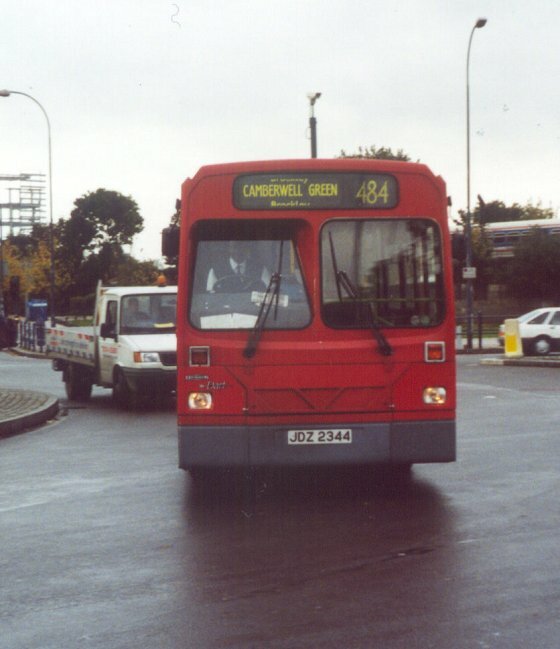 London Buses (Centrewest) took 107 of the little DWs during 1990-1993. 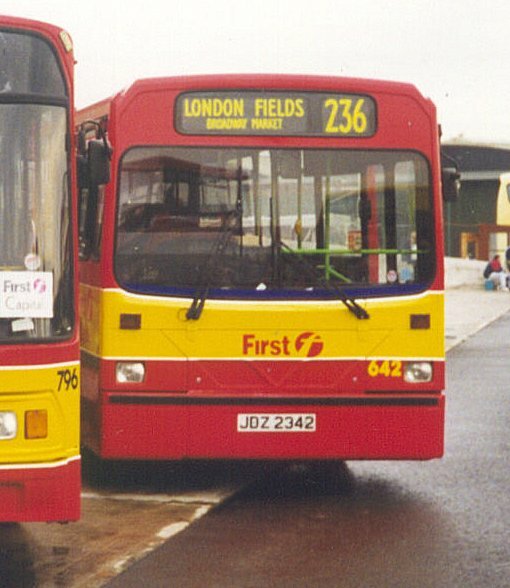 The first fouteen replaced Metrobuses on the 297. 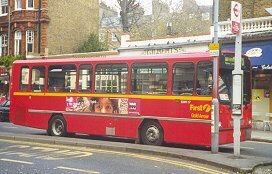 The next major application was on the Gold Arrow routes 28 and 31, operated from Westbourne Park (X). 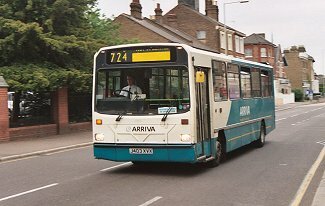 For these DW15-43 received a livery variation, with Gold Arrow fleetnames and route-boards in frames along the sides. But as time went on, and Centrewest used them on a wider variety of routes the special arrangements for these routes became an inconvenience. The frames were removed, and the livery simplified. 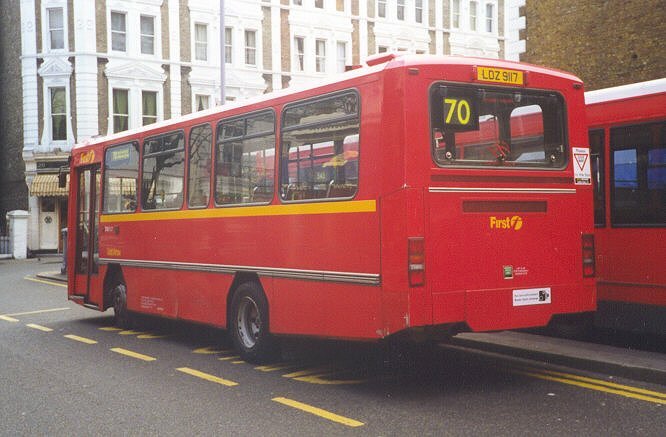 The fleet was carried forward at privatisation in 1994, and subsequently became subject to the 80% red rule as they worked into Central London. The grey skirts began to vanish. 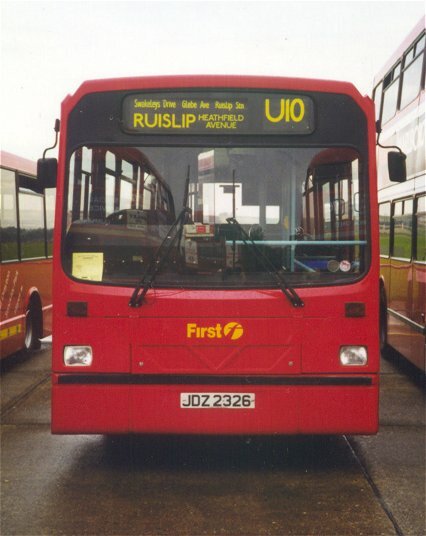 First Bus took over in March 1997, and the livery shifted again, with First Bus logos and yellow stripes appearing. 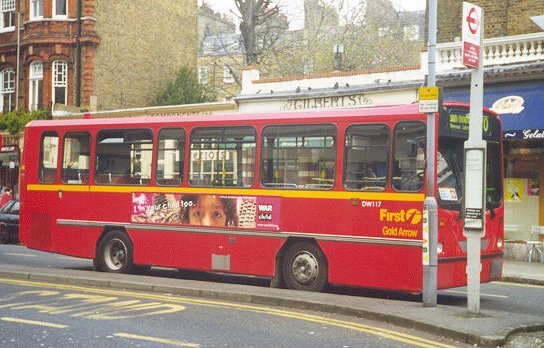 DW117 at South Kensington Station on route 70 in March 1999. Photos by Ian Smith. Click for larger versions. 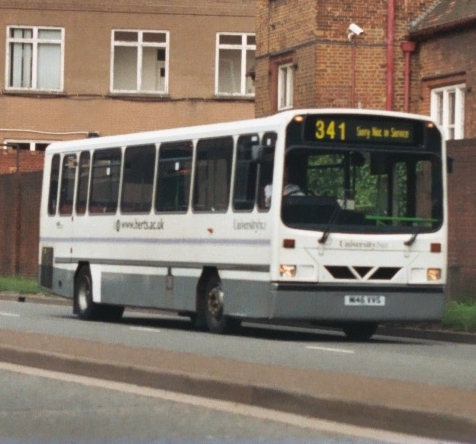 The fleet remained more or less intact until the spring of 1998, when First Group began to disperse them around its other fleets, replacing them with newer Darts. Some went to First Eastern Counties, some to north-east London with First Capital, and others moved west to First Beeline in Berkshire. DW100 suffers a puncture in Knightsbridge, on route 28, June 1998. Photos by Ian Smith. Click for larger versions. 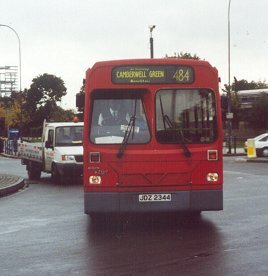 London General received 28 of the DWs, which it used mainly on south-west suburban routes based on Sutton. They received the London Buses livery, with grey skirt and white cantrail band. London General applied a "Streetline" logo. Some received special treatment, being reregistered with Routemaster number plates and receiving red surrounds to the windscreens in place of black. But favoured status ended in 1998, when they were registered back again, and transferred to London Central. This did not last long, and most were soon sold, mainly to The Wycombe Bus Company, to Camden Coaches (West Kingsdown), or Brighton & Hove. London Central's DW44, with red front, helps out on DEL territory - the 484 at Lewisham - on 28th October 2000. 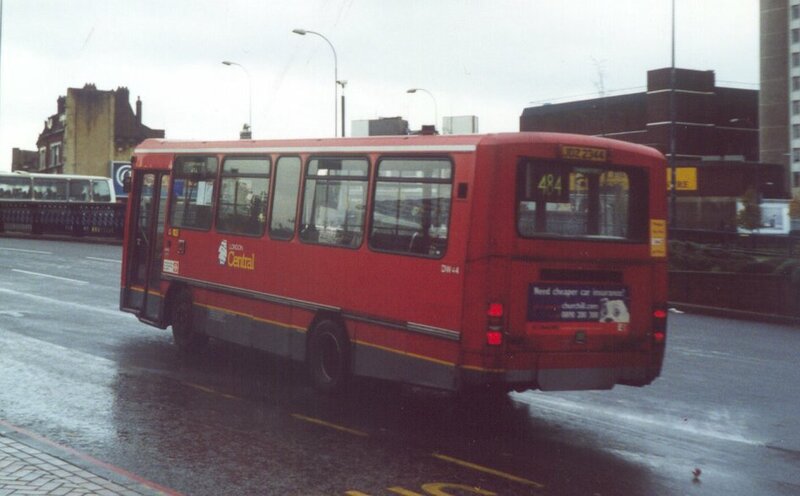 Westlink had also received London Buses DWs, in December 1990, long before the management buyout in January 1994. But these were 9.0m long versions, classified DWL, seating 36. In the usual Dart fashion this was achieved by inserting a standard bay instead of a short one. 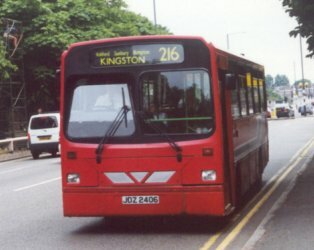 They received Westlink's livery of red with white and turquoise flashes, and operated in the Kingston area, initially on the 371. Three received a special white livery for use on a contract with Kingston University. 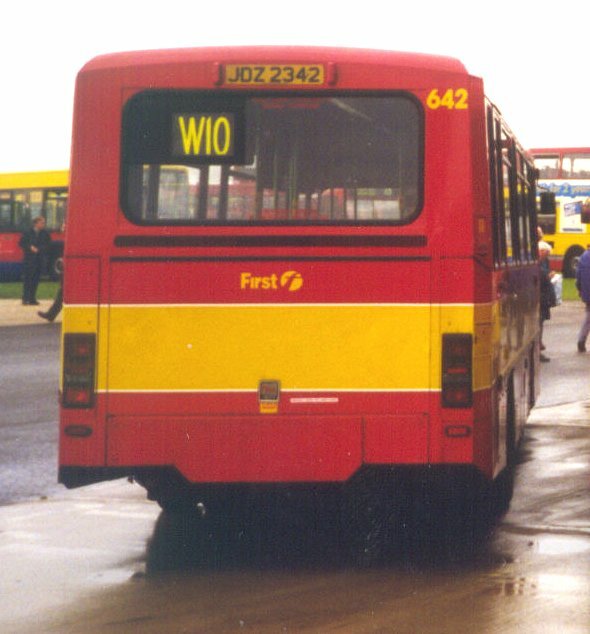 DWL1 had a one-piece windscreen, later replaced by the split version. 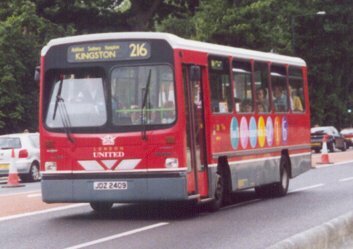 DWL9 is in route-branded London United livery on Kingston Bridge on 29th June 2001, while on the same date DWL6 still wears outdated Westlink stripes. The 216 became their latterday stamping-ground, some in special route-branding with multi-coloured balloons and some still with white and turquoise go-faster stripes. 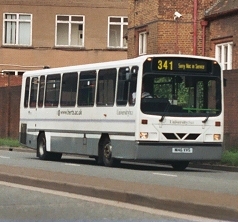 They lasted until replaced by newer, low-floor single-deckers in spring 2000 and November 2001, going then to McKindless of Wishaw (2000) and Pete's Travel of West Bromwich (2001). 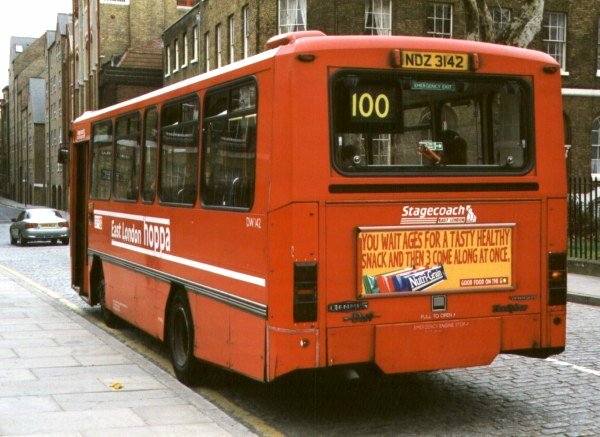 Stagecoach Selkent inherited the seven short buses (DW59-65) that had been bought for use at Catford, but transferred them away to Stagecoach Devon in May 1998. East London won contracts in Barking in 1993 that required Darts, and received both 8.5m and 9.0 m examples: DW133-159 and DWL15-26. The longer examples had a standard bay in place of the short one. These East London Darts also had one-piece windscreens in place of the split version. 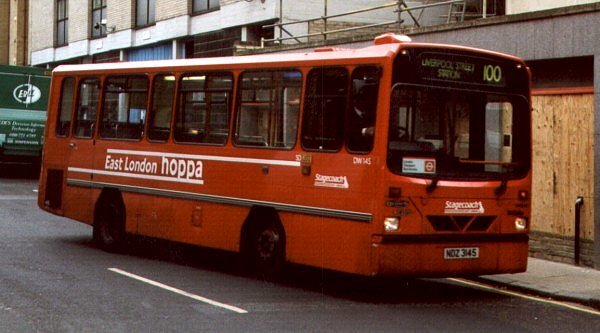 They received red livery with "East London hoppa" branding. 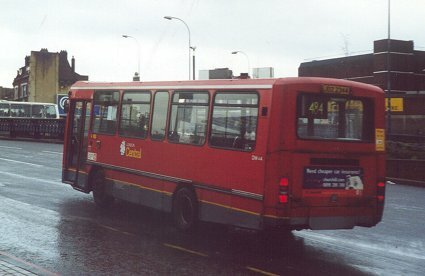 8.5m East London hoppas in Wapping (DW145, DW142), on route 100, February 1998. Photos by Ian Smith. Click for larger versions. 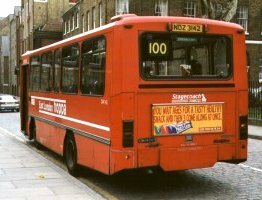 Once again, they have been replaced in London by newer Darts, mostly during 1999, and have been transferred out to other parts of the Stagecoach empire: Red & White, Oxford, Fife, Western, Bluebird, Stagecoach South (Eastbourne).. In 1994 Luton and District, much to everyone's surprise, bought five stretched Wright Handybuses, at 9.8m long. They were painted in the old London Country North-West livery of green and grey, and went to work at Hemel Hempstead. In this format they were rather longer than a traditional RF, if still lighter. After the company was remarketed as The Shires they appeared in blue and yellow livery, with Gade Valley branding. 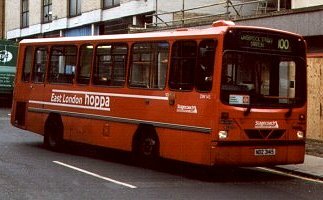 The old north-eastern area of London Country , County Bus, also bought long Wright Darts in 1992, both 9.0 and 9.8 m versions. 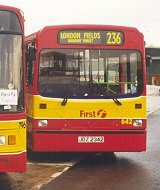 Another followed in 1994, then in 1997 more were acquired with the business of West of Woodford Green. Arriva The Shires acquired some more third-hand. Wycombe Bus had acquired some DWs from London Central in 1999 (DW45-47, 52-53, 66-70), and these were taken over with the High Wycombe operations in December 2000. Some subsequently moved to Harlow, Aylesbury and Garston. 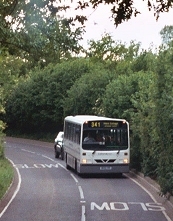 DW68 was one that came via Wycombe Bus. 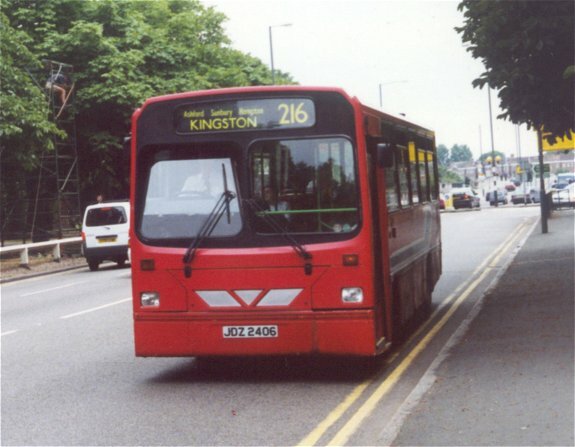 It is seen on route 522 in June 2004, while working from Harlow. 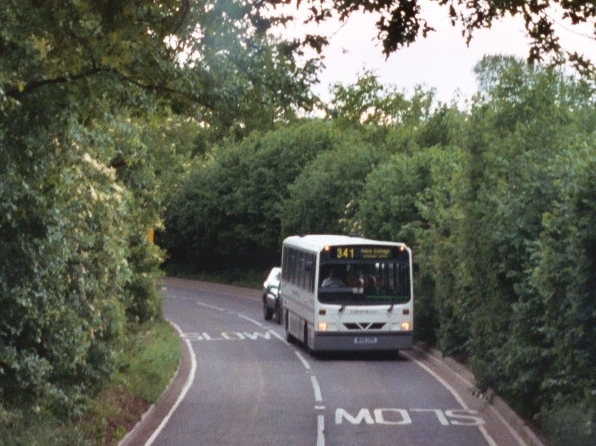 DWL403, on the other hand, originated with County Bus. 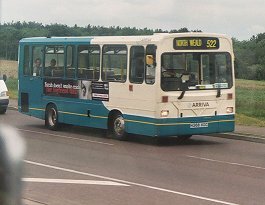 Now at Harlow, it is seen in June 2004 deputising for a GreenLine DAF on the 724 to Heathrow, passing through Hertford. 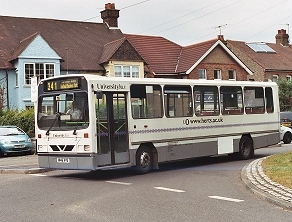 Universitybus at Hatfield, which had started operating services for students but then had spread its net wider across Hertfordshire, bought two 9.8m Darts with Wright Handybus bodywork in 1995, followed by more with Marshall bodies. 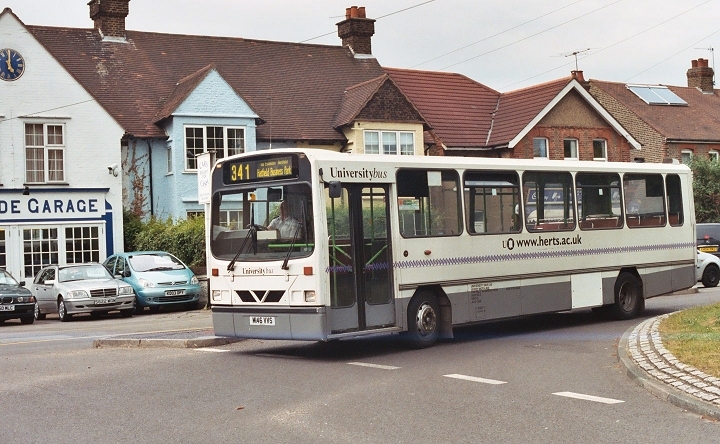 The white buses were put to work on the Welwyn Garden City to Shenley 600 service. 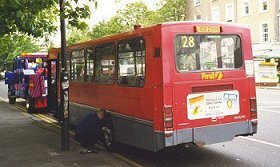 By 2008 they were considered redundant, but the acquisition of Centrebus' St.Albans operations brought a requirement to replace some of the smaller older buses, and the two Handibuses were reinstated. They retained white livery, but acquired uno fleetnames. 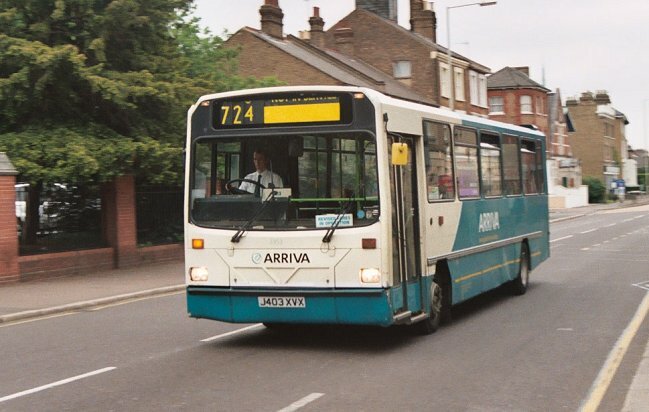 On a Saturday in June 2005 146 was in use on the 341 between Hertford and Hatfield, by now with a grey skirt. 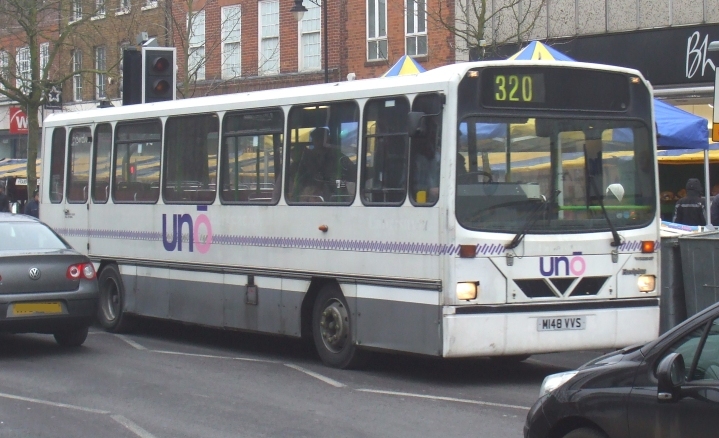 In January 2009 148 was still in out-moded white livery, but now with uno fleetnames. It was in St.Albans, operating the 320 to Hemel Hempstead, on Saturday 10th. 146 and 148 finally succumbed in mid-2009, 146 being bought for preservation and 148 heading for scrap in Yorkshire. 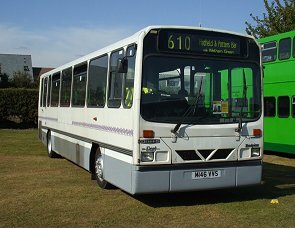 146 was bought for preservation by a Uno driver, and appeared, minus uno markings, at Showbus 2009. Reg's bought an ex Go Northern Handybus, possibly from Milton Keynes, in 2003, as a spare for the new Dart SLF used on the 333 (Hertford - Bengeo), as well as for other duties. The 333 was lost to Golden Boy in April 2006, but the Handybus was retained by Reg's. 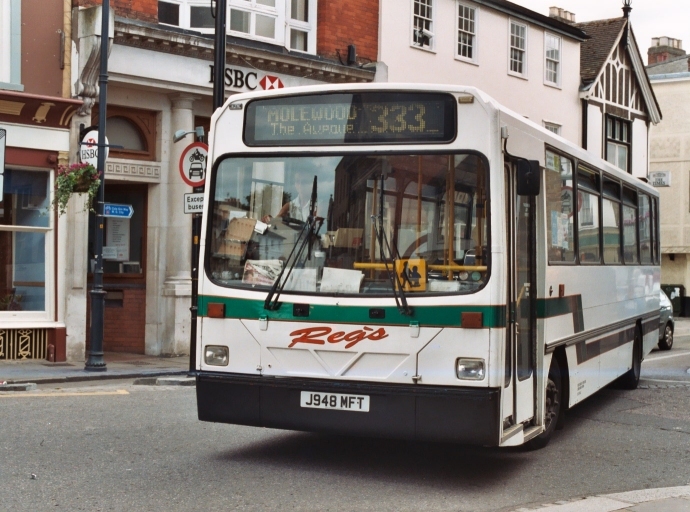 J948MFT squeezes through the narrow section of Hertford town centre on the 333 in June 2005. First Capital began to enjoy the benefits of Dart operation in a significant way in 1998. Until then it had only a couple, one with Wadham Stringer Portsdown bodywork (an ugly beast), and one with the Northern Counties Paladin style. 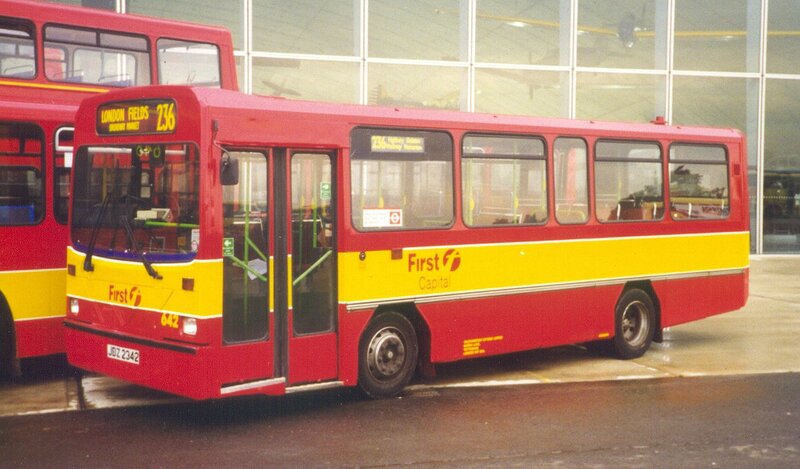 But in 1998 it needed more small buses, and some were transferred from fellow First Group company Centrewest. 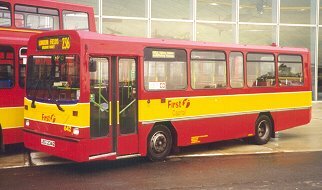 They were among the first recipients of First Capital's new red and yellow livery, shown off at Showbus 98. They are used on W6, W10, 299 and 357 (Sundays). Ex Centrewest DW42, now First Capital 642, looks smart in new red and yellow, with one piece windscreen, at Showbus 98, between rain showers. Transport Web Site: chassis / body numbers. Ian's Bus Stop Dart index. DT. DW. DR.